We’re proud of the work our people do here at Resolute, but these latest nominations are a chance for us to be proud of the work our people are doing with others. 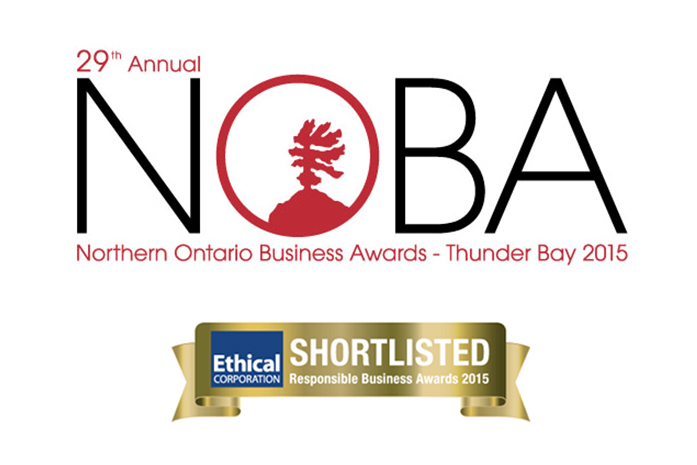 Our First Nations partnerships are the focus of both the Northern Ontario Business Award (NOBA) we’re receiving and the Ethical Corporation’s Responsible Business Award, for which we’ve been shortlisted. Of course, it’s a natural fit for us to be partnering with Aboriginal communities – they form a large part of the population in many of the areas where we operate. But our partnerships are more than that – the people, places and resources are all part of a unique recipe for business success. And that success is being recognized not only for what it has built, but for the future it represents. Sponsored by Northern Ontario Business magazine, this award went to one of our operations: the Thunder Bay sawmill. Our team there was selected for the Judge’s Choice Award, which recognizes the bold, innovative and entrepreneurial – and northern – spirit it takes to make success happen. It celebrates not only the recent integration of a wood pellet plant into our existing lumber manufacturing, but also the long-standing relationship we have developed working with the Fort William First Nation. Our sawmill is located on Fort William First Nation land in a building built by the First Nation and leased to Resolute on a long-term basis. This unique partnership is now in its 12th year. It employs some 200 workers (many of whom are First Nations) and what’s more, it’s the largest and most modern facility of its kind in Eastern Canada. This U.K.-based award shortlisted Resolute for two awards: Best Public Company and Best Business/NGO Partnerships. This last one is for the important collaborations we have developed with our First Nations partners. Specifically, the award looks for companies that have shown clear commitment to a long-term, a mutually beneficial partnership that can demonstrate real social, environmental and governance gains. Our Thunder Bay sawmill’s Fort William First Nation partnership served as a key part of our shortlisted submission, which highlighted the long partnership and important economic impact, not only of these new projects, but of the indirect benefits to local business growth. As the first facility in Canada to work under regulations that facilitate industrial development with First Nations on their land, this is also one of the more obvious examples of great partnerships that work. But our submission also included a list of links to other collaborations, including the $100 Million in contracts announced for six Ontario First Nations, the expanding relationship we have with the Gull Bay First Nation and the Council of the Innu of Pessamit (Quebec) as well as the $125,000 we raised for organizations in the Innu community of Mashteuiatsh, also located in Quebec. Congratulations to all our winners and partners! To learn more about the Northern Ontario Business Awards, visit their web site. To see who some of Resolute’s peers shortlisted for the Responsible Business Awards are, see the list here.